The company’s Asian subsidiary and a group of Japanese financial services companies announced a consortium earlier on Wednesday. It was trading at $US1.26 a coin Thursday at 4:18 p.m. ET. XRP, the cryptocurrency made by Ripple that is focused on bank transfers, hit a fresh all-time high Thursday of $US1.30 a coin, according toMarkets Insider data. It started December at around $US0.25 a coin. The cryptocurrency, which is up 71% this week, has been on a tear since Ripple’s Asian subsidiary and a group of Japanese credit card companies announced a new consortium Wednesday. The consortium aims to identify how blockchain and distributed ledger technology can be deployed in credit card payments. 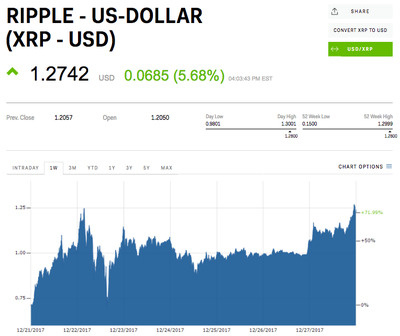 “Asians are going mad for Ripple,” Alexey Ivanov, CEO and cofounder of Polynom Crypto Capital, a Moscow-based cryptocurrency and blockchain investment fund manager, told Forbes.